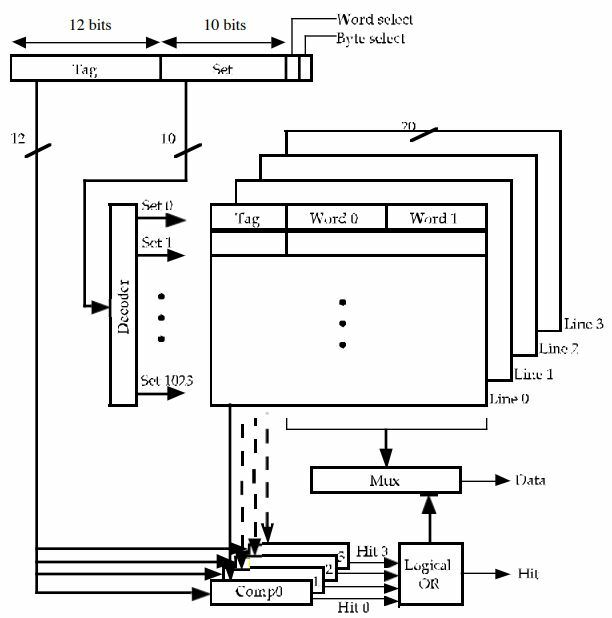 Given the following specifications for an external cache memory: four-way associative set; line size of two 16-bit words; capable of accommodating a total of 4K 32-bit words from main memory; used with a 16-bit processor that emits 24-bit addresses. Design the cache structure with all the relevant information and show how it interprets the processor addresses. I am surprised how it is said that the 16-bit processor generates 24-bit addresses. it's possible? I never encountered such problem. How can the cache and main memory have different word sizes? Here, the word size of the cache is 16 bits and the word size of the main memory is 32 bits. Taking into account the unusual scenarios (assumptions I made) explained in points 1 and 2 above, am I correct with the previous calculations? The answer only gives a diagram (without explanation) that says 1 bit per word, 1 bit per byte address and 12 bits per label. So, am I wrong? Previous Previous post: Snowden: list of websites that still do not support SSL?